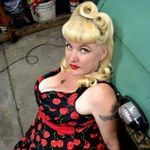 "I stand up for what I believe is right"
About Me I am a Pin up model for Dames For Dreams. I do alot of charity work and fundraisers. I am a proud mother. I have a passion for Pitt Bull rescue. Wild Fact About Me I'm the wild card. My Philosophy Treat other the way I would like to be treated. What Gives Me Hope Knowing that one person can make a difference. If I were Mayor, I'd make the world a better place by Free health care for all.